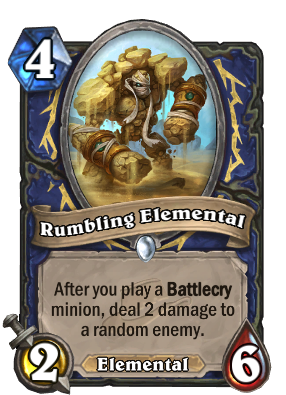 why is this card isnt elemental? This card is actully good, its like Knife juggler but doing 2 damage and its very easy to have lots of good battlecry cards in deck. This guy in the new tavern brawl (1/28/16) is awesome. The one where every minion is 1/1 costing 1 mana. Turn ten --> x2 Rumbling Elemental + something like North Sea Kraken [/card] + Youthful Brewmaster + Coldlight Oracle or any other draw cards and battle cry deal damage (up to 8 cards). This Means at least 32 random damage to minion or face. FYI brewmaster is to make room to throw down another card. It may not always win in TB but it is better than trying to go toe to toe with high level legendary cards when you don't have much. The effect just doesn't seem good enough to justify playing a 2/6 for 4 mana. It could work better if instead of a 2 dmg shot, it shot 3 missiles. Or maybe it should be a 2/5 for 3 mana with the same effect. Ohh man, if this works anything like Wild Pyromancer/Shadow Madness, you would even get to deal 2 damage. This is one of the 45 comments in Hearthpwn that have ever got 50 upvotes, and one of the few that isn't a deck. I was expecting something more epic. Well the card is epic but. Ship's Cannon, you look kinda different. New haircut? More elementals!!! not so much hyped with the battle cry synergy but will definitely build an elementl themed deck just for fun! I'm temped to run a whole deck of cheap battlecry minions and this guy for lols. This actually seems like a decent card, considering the amount of battlecry minions there are. I don't get why Flamewaker or Knife Juggler succeed over this card, it seems like it should be just as useful. well at least it will prob live the turn so u cn capitalize on its effect. its not that bad vs aggressive decks. i kiiiiida like this card but its not that great.